"Our school is here to ensure we all learn so that we are prepared for our future." 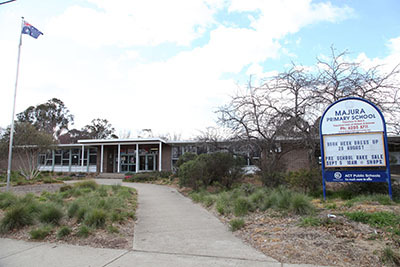 Majura Primary School is a preschool to year six (P-6) public primary school, situated in North Canberra, and is the local neighbourhood school for children from Watson and Downer. Majura Primary School has grown over recent years and the building has been extensively modernised and refurbished, though has retained predominately traditional style classrooms. The school has an attractive library, performing arts space, kitchen facilities and an extensive kitchen garden producing high quality fruit and vegetables. Majura Primary has an enrolment of approximately 600 students across preschool to year 6, with classes organised into year level groupings. For more information see our "tour our school" page, or click on the relevant pages on the rest of the website.